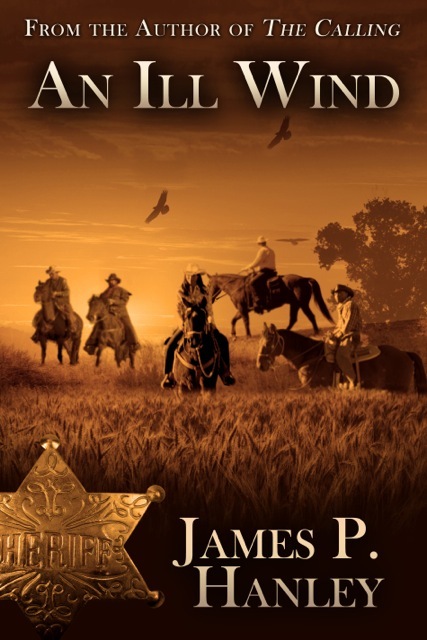 In this sequel to The Calling, Sheriff Luke Atwell and his deputies face individual and collective challenges from outlaws, gunfighters, renegade Indians, card sharps, and a thieving medicine show in a Kansas town in the 1870’s. The personal lives of the lawmen also change and nature takes its destructive toll on the town and its residents. When a black neighbor’s family is attacked and the oldest son killed, the sheriff gets the help of federal law enforcement and they chase a band of marauding ex-Confederates out to undo the changes resulting from the Civil War. Jim Hanley is a Human Resources professional, adjunct professor and short story writer, Jim has had over 70 stories appear in print and online publications. An Ill wind is the second in a series; a third is nearly done. The author was an avid rider but was thrown from a horse three times. Characters (besides the main ones) in book 0ne appear in book Two and new characters in book Two appear in the Third. While the vast majority of characters in Book Two are adults, child characters play an important role in book Two. While largely fiction, some of the events and people are true. The story is set in Kansas, but the writer has never been to the state. Women are strong characters not willing to play second fiddle to the men in their lives. One of the main characters, Peter, gets distracted by attractive women but still pines for a young lady killed by outlaws. Peggy, a main character once married to a failed business owner proves to be a successful store owner herself. Book one ends with the suggestion of a wedding; book Two opens with one. The deputies looked out the large window at the back of the hotel and saw debris begin to fly across the open field. Thunder sounded like cannons fired nearby and streaks of lighting cut across the sky with a few bolts pointed straight down like spears. When the three lawmen went outside, they saw town folks rushing indoors wherever they could. The crack of thunder rattled horses still tied to a rail. One animal broke free and ran down the street as if kicked. The rain came down in sheets. A huge cloud in the distance had a greenish-black base and the wind seemed to be pulled upward into the center of the cumulus. Atwell and his deputies stared at the single cloud which seemed to take over the sky. Air below was spinning. Soon a funnel formed, stretching down, but still well above the ground. White droplets fell out of the cloud; Sheriff Atwell knew it was hail. As the storm approached, the funnel widened and hovered just a few feet above the soil. The counter-clockwise winds snapped trees, splintering and launching wood in all directions. Laden with dirt and debris, the funnel darkened and reached down to touch the earth. A planted field just at the edge of town was a mass of swirling, newly emerging produce. By the time the twister was fully shaped and vertical, the width had reached over fifteen yards.